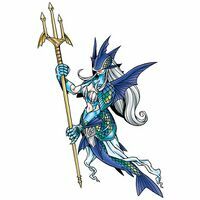 Possessing the attribute of "water", it is one of the legendary Ten Warriors Digimon that saved the ancient Digital World. 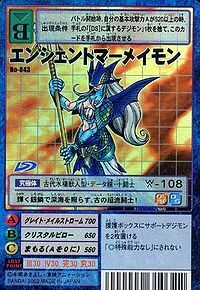 An Ultimate who existed only in the distant past, it is a guardian goddess of the birthplace of Digimon, the "Net Ocean". It rules the whole of the far-reaching "Net Ocean", and is able to handle all water, such as the ocean currents and tidal waves, as if they were its own limbs. It is said that countless continents and islands have been erased when Ancient Mermaimon felt angry. 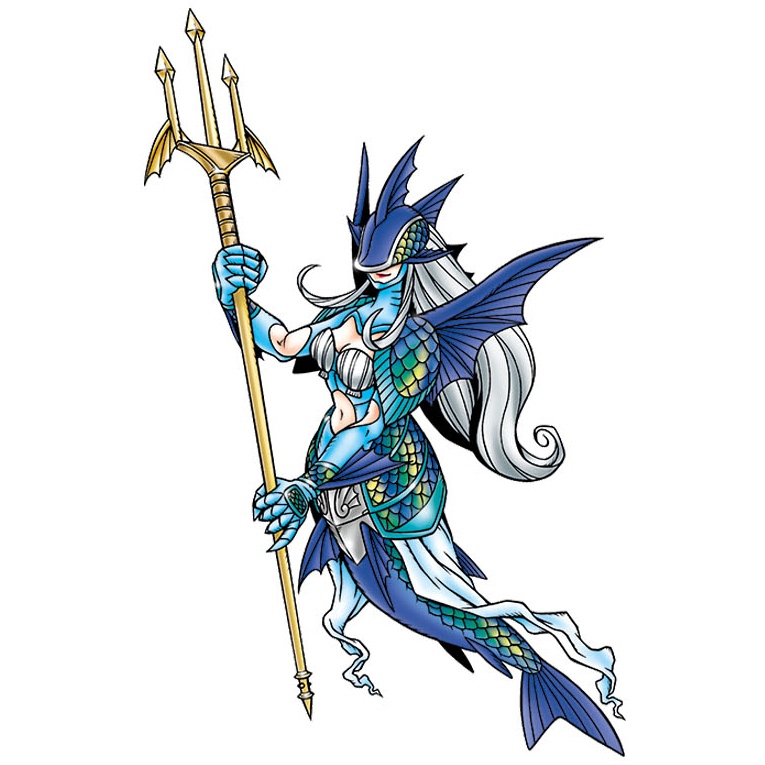 Ancient Mermaimon's abilities were later passed on to the "Aquatic Digimon". Its Special Moves are generating a gigantic maelstrom which swallows everything in the water (Great Maelstrom), and crystallizing water into supersolids, then firing them off like a machine gun (Crystal Billow). Possessing the attribute of "Water", it is one of the legendary Ten Warriors Digimon that saved the ancient Digital World. 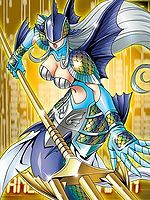 An Ultimate who existed only in the distant past, it is a guardian goddess of the birthplace of Digimon, the "Net Ocean". 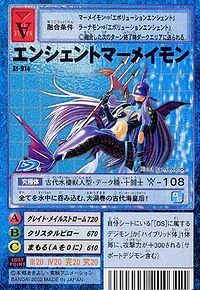 Ancient Mermaimon's abilities were later passed on to the "Aquatic Digimon". Title: 「伝説の水の闘士」 — "Legendary Warrior of Water"
「海底の悪魔獣」 — "Demon Beast of the Seabed"
| Mermai is short for Mermaid (「マーメイド」 Māmeido). A huge whirlpool that captures enemies in the middle of water. Creates water crystal bullets, firing them like a machine gun. 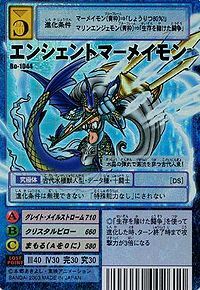 Ancient Mermaimon was one of the Legendary Warrior Ten whose spirit was reborn in the Human Spirit of Water to create Ranamon and the Beast Spirit of Water to create Calamaramon. 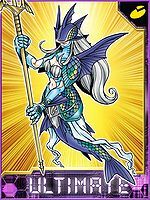 Ancient Mermaimon can only be obtained as a collectible card. Its card is part of the Warrior Ten (十闘士 Juttoushi) set. 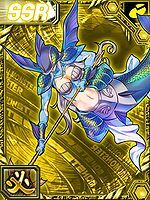 Ancient Mermaimon is available as a Digimon Medal. 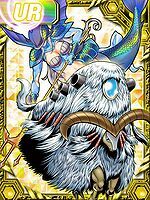 Ancient Mermaimon is an unobtainable Boss Digimon. It swallows everything in the water, the ancient Ocean Queen of maelstroms! 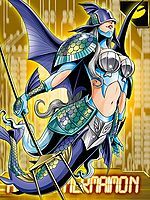 This ancient warrior of great currents illuminates the ocean depths with its shining silver scales! An ancient mermaid who pierces the rapids with its crystal bullets! 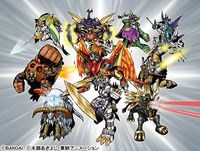 ↑ 7.0 7.1 Digimon Frontier: "Go Beyond Time! The Beginning of a New Legend"